Occult breast cancer (OBC) or breast cancer presenting without an evident primary tumor is a rare presentation and can lead to a diagnostic dilemma. Further, the treatment of OBC is a subject of much controversy. We present a 47-year-old male who had been admitted with a fungating lesion in his axilla. As clinical examination was unremarkable, a punch biopsy from the lesion revealed a medullary carcinoma of breast. The purpose of this report is to highlight this unusual presentation of carcinoma breast and the treatment dilemma that it poses, especially in men, where breast cancer is seldom considered a diagnostic possibility in the setting of occult primary cancer. This is the first-ever case report of medullary carcinoma presenting as OBC in a male. Breast cancer presenting as isolated axillary nodal metastasis is very rare, with a reported incidence of 0.3%–1% among breast cancer patients.,, With the advent of more sensitive means of detecting primary tumors, such as breast magnetic resonance imaging (MRI) and high-quality mammography, the incidence of occult breast cancer (OBC) is decreasing. In a female presenting with malignant axillary lymphadenopathy, the breast is usually the most common site of primary malignancy, and this has led to many patients presenting with isolated axillary metastasis being treated with mastectomies with axillary node dissections., However, there are some clinicians who advocate breast irradiation with axillary dissection and adjuvant systemic therapy if no primary tumor can be detected on MRI. Breast cancer of male (BCM) is very rare, accounting for around 1% of the cases of breast cancer. This makes it a very unusual diagnosis is the setting of malignancy with unknown primary. There is little evidence to guide treatment in BCM, and there have been no randomized controlled trials comparing treatment options, with most recommended treatments stemming for low-level evidence. Therefore, evidence-based treatment for OBC in males, is a hard to come by. 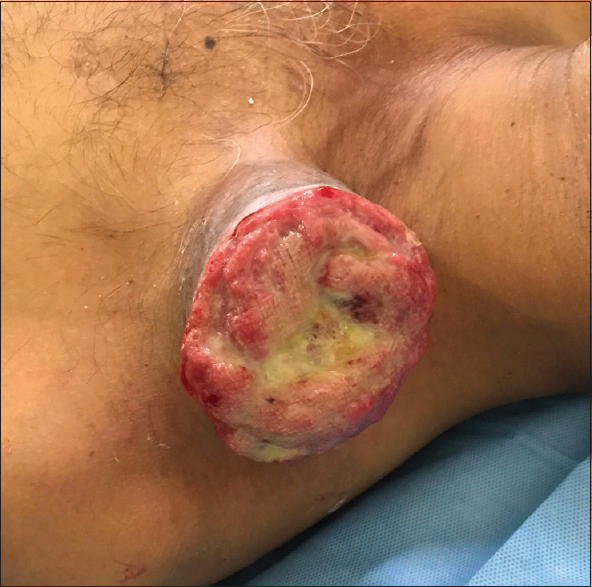 A 47-year-old male with no comorbid illness presented with a nonhealing ulcer of the left axilla of 4 months duration, which actually started as an asymptomatic swelling, gradually increased in size and then ulcerated discharging pus. There was no symptom of breast or metastatic disease, constitutional symptoms, or any other swellings over the body. On examination, there was a foul smelling ulceroproliferative growth in the left axilla discharging pus and enlarged lymph nodes. It was nontender but with restricted mobility [Figure 1]. Examination of the left breast revealed no palpable lump, absent left supraclavicular lymph node, and normal left upper limb. The contralateral breast, axilla, skull, and spine were normal. Systemic examination of the chest, abdomen, lymphoreticular system revealed no abnormality. 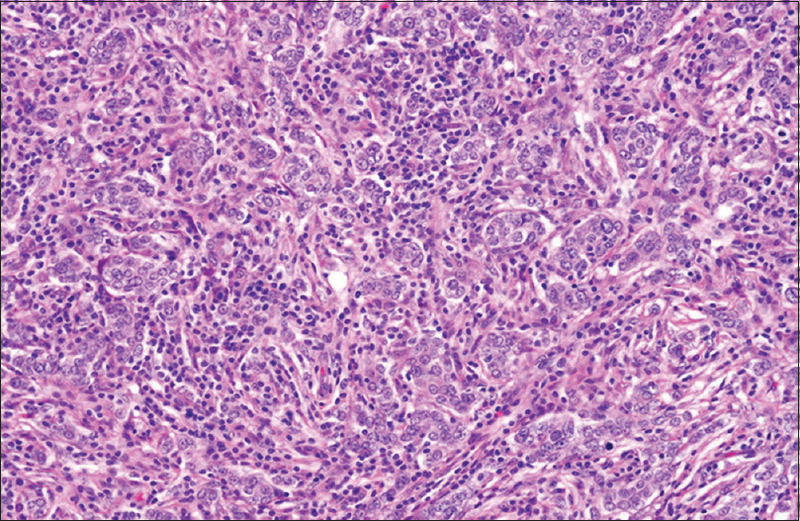 Hence, a punch biopsy of the lesion was done, which showed a tumor composed of cells in syncytial sheets, marked mononuclear infiltrate, pleomorphic nuclei, circumscribed edge, and absence of glandular differentiation that was suggestive of medullary carcinoma of the breast, in a background of lymph nodal tissue [Figure 2]. The tumor was estrogen-progesterone receptor (ER-PR) positive but HER2/neu negative. The patient was then subjected to a MRI of chest and bilateral axilla, to look for any primary in the breast. The MRI did not show any lesion in the breast or chest wall but showed a fungating left axillary lymph nodal mass, other enlarged left axillary lymph nodes with areas of necrosis. Ultrasonography of the abdomen and the bone scan was also done to rule out systemic metastases and all were found to be normal. He received three cycles of induction (neoadjuvant) chemotherapy: Taxotere, adriamycin, and cyclophosphamide (TAC) regimen with docetaxel (taxotere) 75 mg/m2 intravenous (IV0 on day 1 plus doxorubicin (adriamycin) 50 mg/m2 IV on day 1 plus Cyclophosphamide 500 mg/m2 IV on day 1 every 3 weeks after which the lesion was amenable for surgery and underwent a left modified radical mastectomy, the final histopathology report of which revealed no tumor tissue in the breast but malignant axillary lymph nodal metastasis from a medullary carcinoma of the breast. Postoperatively, he received three more cycles of adjuvant TAF chemotherapy. Given the tumor characteristics, he also received radiation to the operated area (60 Gy over 5 weeks). As the tumor was ER-PR positive, he has been on Tamoxifen 10 mg once daily. He has been kept under close follow-up and is disease free for the last 3 years. There is a therapeutic dilemma while managing patients with OBC even after extensive imaging. While there is a consensus that the involved axilla needs to be addressed with a formal axillary dissection, whether or whether not to perform a mastectomy on the ipsilateral breast remains a dilemma. However, a few studies suggest that a mastectomy may be omitted, and the breast can be addressed with radiation. A recent review reported that up to 72% of mastectomy specimens for OBCs contained an occult malignancy on pathological examination, with the authors advocating routine mastectomies in OBCs to maximize cytoreduction and preclude the need of frequent breast surveillance. Axillary dissection is not only therapeutic in these patients but also gives valuable prognostic information. The number of involved lymph nodes is a direct indicator of 5-year survival according to studies, with survival of more than 90% if less than four nodes are involved. The use of adjuvant systemic therapy has been an integral part of the treatment of OBC, but its role has been called into question. A recent meta-analysis showed that no type of chemotherapy conferred a definitive survival benefit in patients with OBC. In addition, the advent of targeted therapy in the form of HER2 blockers and endocrine ablation has provided a far less morbid alternative to conventional chemotherapy. In the attempt to standardize treatment protocols, it is important to remember that OBC may represent a far more heterogeneous entity than previously thought, with studies showing that OBC with isolated axillary metastasis is a vastly different entity from OBC with visceral metastasis, with the former behaving more like AJCC stage II (node positive) disease, while the latter harbors diverse genetic aberrations making it behave very differently, necessitating different treatment strategies. This makes it particularly suited for personalized breast cancer treatment. Ward EM, DeSantis CE, Lin CC, Kramer JL, Jemal A, Kohler B, et al. Cancer statistics: Breast cancer in situ. CA Cancer J Clin 2015;65:481-95. Hur SM, Cho DH, Lee SK, Choi MY, Bae SY, Koo MY, et al. Occult breast cancers manifesting as axillary lymph node metastasis in men: A two-case report. J Breast Cancer 2012;15:359-63. Cedolini C, Bertozzi S, Londero AP, Bernardi S, Seriau L, Concina S, et al. Type of breast cancer diagnosis, screening, and survival. Clin Breast Cancer 2014;14:235-40. Redig AJ, McAllister SS. Breast cancer as a systemic disease: A view of metastasis. J Intern Med 2013;274:113-26. Thomas MA, Ochoa LL, Zygmunt TM, Matesa M, Altman MB, Garcia-Ramirez JL, et al. Accelerated partial breast irradiation: A Safe, effective, and convenient early breast cancer treatment option. Mo Med 2015;112:379-84. Grenader T, Goldberg A, Shavit L. Second cancers in patients with male breast cancer: A literature review. J Cancer Surviv 2008;2:73-8. Serarslan A, Gursel B, Okumus NO, Meydan D, Sullu Y, Gonullu G, et al. Male breast cancer: 20 years experience of a tertiary hospital from the middle black sea region of Turkey. Asian Pac J Cancer Prev 2015;16:6673-9. Oger AS, Boukerrou M, Cutuli B, Campion L, Rousseau E, Bussières E, et al. Male breast cancer: Prognostic factors, diagnosis and treatment: A multi-institutional survey of 95 cases. Gynecol Obstet Fertil 2015;43:290-6. Gu GL, Wang SL, Wei XM, Ren L, Zou F ×. Axillary metastasis as the first manifestation of occult breast cancer in a male patient. Breast Care (Basel) 2009;4:43-5. He M, Liu H, Jiang Y. A case report of male occult breast cancer first manifesting as axillary lymph node metastasis with part of metastatic mucinous carcinoma. Medicine (Baltimore) 2015;94:e1038. Korde LA, Zujewski JA, Kamin L, Giordano S, Domchek S, Anderson WF, et al. Multidisciplinary meeting on male breast cancer: Summary and research recommendations. J Clin Oncol 2010;28:2114-22. Sousa B, Moser E, Cardoso F. An update on male breast cancer and future directions for research and treatment. Eur J Pharmacol 2013;717:71-83. Dietz JR, Partridge AH, Gemignani ML, Javid SH, Kuerer HM. Breast cancer management updates: Young and older, pregnant, or male. Ann Surg Oncol 2015;22:3219-24. Zagouri F, Sergentanis TN, Azim HA Jr., Chrysikos D, Dimopoulos MA, Psaltopoulou T, et al. Aromatase inhibitors in male breast cancer: A pooled analysis. Breast Cancer Res Treat 2015;151:141-7.